Dr. William A. Zoghbi is the Elkins Family Distinguished Chair in Cardiac Health, chair of the Department of Cardiology at Houston Methodist DeBakey Heart and Vascular Center, and Professor of Medicine at Weill Cornell Medical College and the Institute of Academic Medicine. 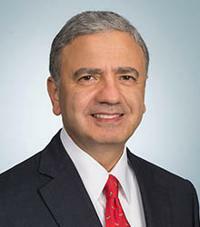 As an internationally renowned cardiologist and researcher, Dr. Zoghbi has dedicated his career to advancements in clinical cardiology, enhancing non-invasive approaches to assess and managing cardiac disease through cardiovascular imaging. His areas of expertise include valvular heart disease, coronary artery disease and heart failure, emphasizing a patient-centered approach to medicine and general cardiology. From 1985 to 2005, he served on the faculty of Baylor College of Medicine and was the John S. Dunn Professor of Medicine. In 2005, Dr. Zoghbi joined the Houston Methodist Specialty Physician Group and established the hospital's Cardiovascular Imaging Institute, a unique entity where all cardiovascular imaging modalities are integrated for enhanced patient care, education, and research. Dr. Zoghbi is a leader in cardiology, nationally and internationally. Throughout his career, he has been active in the American College of Cardiology (ACC), American Society of Echocardiography (ASE) and the American Heart Association. In 2008 and 2012, he served as president of the ASE and ACC, respectively. In 2013, the ACC honored Dr. Zoghbi as a Master of the American College of Cardiology.